118. C. Covault, "Japan Designing Atlas-Class Rocket To Launch Lunar, Planetary Missions", Aviation Week and Space Technology , 20 August 1990, pp. 63-68. 119. K. P. Dawson, "Japanese M-5 Faces Delay to '95 Start", Space News, 15-21 June 1992, p. 4. 120. "Japan Presses on With M-5 Project Despite Motor Casing Problems., Aviation Week and Space Technology, 10 August 1992, pp. 48-49. 121. J. Onoda et al, "Structural Development Status of Japanese Next Generation Launcher for Scientific Satellites", Paper IAF-93-1.2.208, 44th Congress of the International Astronautical Federation, 16-22 October 1993. 122. Kvodo News Service, Tokyo, 21 June 1994. 123. E. Sekigawa, "Japan Confirms Delays in M-5 Booster Launch", Aviation Week and Space Technology, 27 June 1994, p. 82. To keep up with the increasing demand on payload capability and to enable interplanetary missions anticipated in the late 1990s and beyond the year 2000, ISAS has initiated the M-V Iauncher development, a 3-stage, solid-propellant system capable of lifting 1.8 metric tons into a LEO of 250 km, It had more than three times the launch capability of the M-S and enables missions to Mars, Venus, asteroids and beyond. It is the largest solid propellant rocket ever built in Japan and combines ISAS up-to-date results on solid propellant propulsion system, new light-weight materials and structures, flight control and guidance, aerodynamics. avionics. and others. Using M-V in this way, ISAS expanded its observation and exploration envelope and these missions are expected to open a new Japanese space science era and to yield better understanding of the solar system in the coming ten years and beyond. The first flight was planned for 1996 for launching the MUSES-B satellite into an elliptic orbit for VLBI (Very Long Base Interferometry) for radio astronomy. The second mission was to send the spacecraft LUNAR-A to the Moon for the purpose shooting three penetrators into the lunar surface. The third was to launch the PLANET-B Mars orbiter designed primarily to observe the geomagnetic field around Mars. The next was a satellite named ASTRO-E for the continuing X-ray astronomy program. These four missions were planned within the century. One mission was approved for shortly after the turn of the century, which was a challenging asteroid sample return mission named MUSES-C.
nose fairing opening mechanism, and FOG (fiber optical gyro) to sense vehicle attitude. The inaugural flight of the new M-5 was delayed until 1997, primarily due to technical difficulties. On 21 June 1994 the M-5 first stage motor was successfully tested at ISAS' Noshiro rocket testsite, and another test with a flight-design model was slated for 1995. Plans to employ extendable motor nozzles on both the second and third stages were scaled back to only the third-stage. Produced jointly by Nissan (motors and fairing) and Mitsubishi Heavy Industries, the M5 will permit ISAS to undertake more ambitious scientific missions, particularly beyond Earth orbit (References 118-124). 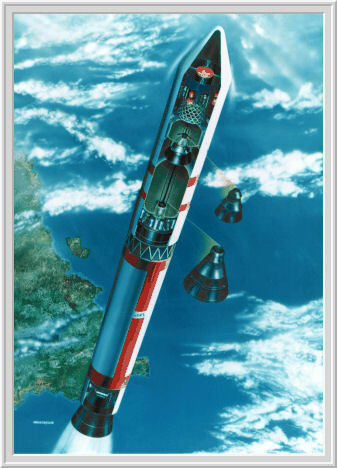 For their role in successful missions including planetary explorations, M-V rockets were highly praised as “the best solid-propellant rockets in the world.� However, after the launch of M-V-7 in September 2006, production of the M-V series was discontinued due to cost concerns. it was replaced by the Epsilon, a three-stage solid-fuel rocket that builds on existing Japanese rocket technology: an H-IIA solid rocket booster in the first stage, and two upper stages based on those used in the discontinued M-V launch vehicle. Epsilon's first flight was expected to cost $38 million (3.8 billion yen) – almost half the $75 million (7.5 billion yen) cost for M-V.